Beams are long slender structural elements that resist loads that are applied laterally to the beams axis. This causes its mode of deflection be primarily in bending. The reaction forces are always at the beams support point. 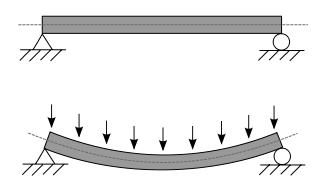 Due to this type of loading, the total effect on a beam due to a bending load produces both shear and normal stresses within the beam. Traditionally beams were used as support structures in buildings which is a civil engineering structural element. However, today beams can be found in all sorts of structures, such as automobile frames, aircraft, and machine frames, to name few. Due to this fact, mechanical engineers also need to have an understanding of what a beam is and how to calculate its respective stresses and displacements due to a load. Simply Supported Beam. The ends are free to rotate as seen in the image above. Fixed. This beam is support on both ends and is restrained from rotation. This type of beam is statically indeterminate. Over Hanging Beam. This is a beam that is extending beyond one of its support points. Continuous beam. A continuous beam is a beam that has more than two supports. These type of beams, depending on the types of support, can become statically indeterminate. Cantilever beam. A cantilever beam is a beam that is fixed on one end but does not have a support on its other end.